Shelfield Under 9’s looking for players. 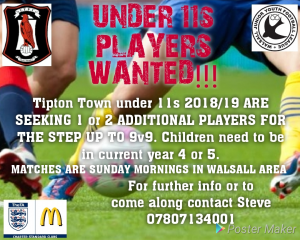 Well established charter standard club looking for players to strengthen our under 9’s team. We have been together for 2 seasons and currently train twice a week at our own grounds in Rushall. Wednesday 6.30-7.30 and Saturdays 10.30-12.00. Boys will be going into year 4 in September. If you have any boys who are mad on football, this is the place to be. If you are interested, please contact Ian on 07834 004128. WJYFL, along with all other youth leagues in Staffordshire, will be introducing Sin Bin’s for the coming season for all age groups (U7 to U17). THE SIN BIN WILL ONLY BE FOR PLAYER ACTS OF DISSENT. A training session for ALL team mangers, coaches and any other club officials will be held on Thursday 16th August 2018 at Wolverhampton University, (Walsall Campus, off Broadway) in Samuel Johnson Lecture Theatre from 7.30 pm until 8.30 pm. The session will be led by staff from Staffordshire FA with WJYFL committee members in attendance. All teams must have a representative at the meeting. If a manager or coach is unable to attend, please arrange for someone to attend on their behalf. Looking to add to an already strong squad going into to the new season. We train in the cannock area. Anyone interested contact Mark on 07854711041. Players are wanted for a new Four Oaks U9 team (children starting school year 4 in Sept). Contact Andy if interested on ‭07961 959174. Tipton Town u10’s (Year 5 from September 2018) are looking for new players due to losing several players to Wolverhampton Wanderers FC Academy. We have a proven track record of developing players and producing good footballing teams. We are looking for players of all positions who are looking to improve as footballers! If you want more information about trial days in August please call Jay on 07376 425609.